In this blog post we are going to learn how to use PostgreSQL with Entity Framework in an ASP.NET MVC application. I wanted to investigate using Entity Framework with PostgreSQL in an ASP.NET MVC application quickly. Instead of writing a trivial demo that simply read and write data from the database, I decided a better approach would be to convert an existing ASP.NET MVC application that already uses Entity Framework (with another database) to work with PostgreSQL. I decided to use MvcMusicStore. It is one of best documented tutorial ASP.NET MVC applications. 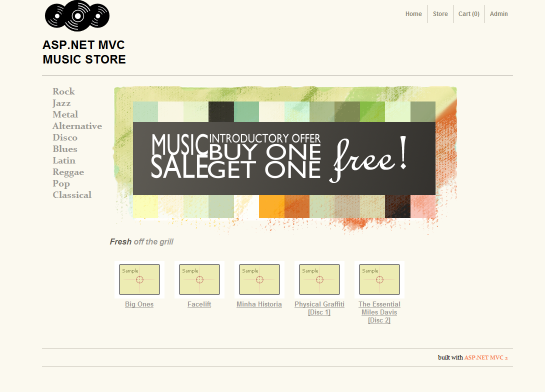 This is the description on its project site: “MVC Music Store is a tutorial application built on ASP.NET MVC. It’s a lightweight sample store which demonstrates ASP.NET MVC using Entity Framework”. By going through the process of converting a working application, I can concentrate on the area that are specific to using Entity Framework with PostgreSQL. I can also easily perform basic testing to verify the changes I make by just running the application. The rest of this post documents that steps I have gone though to convert the MvcMusicStore. A working installation of PostgreSQL. I use PostgreSQL version 9.3. A development environment where you can compile and run ASP.NET MVC application. Download “MvcMusicStore”. Unzip the folder and open the project. At this point, you should be able to compile the project. If not, there is something wrong with your development environment, resolve it now before you make more changes that could complicate it further. The project is configured to use SqlServerSe If it’s installed, you should be able to run the application. Step 2: Prepare the PostgreSQL database. MvcMusicStore uses EntityFramework Code First. In the global.asax.cs file, it specifies the SampleData class as the database initializer. Take a look at the SampleData class, notice that it inherits from DropCreateDatabaseIfModelChanges. This means that the application will re-create and re-seed the database when the schema changes. Unfortunately database migration and creation is not yet supported in Npgsql Entity Framework. We will have to create the database and seed the data manually. a) Create a database in your PostgreSQL server. Name the database MvcMusicStore. b) Next, we need to create the tables and seed them with data. The MvcMusicStore download contains a \MvcMusicStore-Assets\Data\MvcMusicStore-Create.sql file that works for MSSQL. We can use it as the base and adapt it for postgreSQL. You can use the finished script here MvcMusicStore-Create-PostgreSQL. The file has documentation on what was changed from the original script. Step 3: Install ADO.NET provider and Entity Framework provider for postgreSQL. You will have multiple options here. We will use Npgsql. The MvcMusicStore download uses EntityFramework 4.1, which is two versions older than the current version (Entity Framework 6). Let’s upgrade it to the latest first via Nuget. Next, Install Npgsql PostgreSQL Entity Framework provider. This will also install its dependency which includes the Npgsql ADO.NET Provider. Step 4: Update web.config to tell the run time about our database connection and Entity Framework configuration. a) Update the connection string like below. Remember to replace the information in the connection string to the values in your environment. Note: Do not change the name of the connection string name. The name MusicStoreEntities matches the project’s DbContext class name. This is how Entity Framework figures out which connection string to use. c) Add the system.data element as follow. <add name="Npgsql Data Provider" invariant="Npgsql"
support="FF" description=".Net Framework Data Provider for Postgresql"
Step 5: Modify the MvcStoreEntities (DbContext) class to configure the table names the Entities mapped to. PostgreSQL creates data tables in the public schema by default. This is different than the default Entity Framework convention. Override the OnModelCreating method to specify the new table name mapping. Comment out the following line in the global.asax.cs file. Otherwise you will get error since Npgsql does not support migration and database creation. Compile and run the application again. You are now running MvcMusicStore with Entity Framework 6 against a postgreSQL database. The original MvcMusicStore uses two databases: one for the store, another for the membership. The blog post only covers converting the store database to PostgreSQL. The original MvcMusicStore uses ASPNET Membership, you probably want to use the new ASPNET Identity instead. (“The ASP.NET Identity system is designed to replace the previous ASP.NET Membership and Simple Membership systems”). In the process of creating PostgreSQL.AspNet.Identity.EntityFramework, I found that Npgsql now has better Entity Framework 6 support. It can now auto create the database. The GitHub repo has a demo that take advantage of the auto database creation. There is a new MvcMusicStore project on GitHub that’s targeting ASPNET 5 (vNext). It uses the ASPNET Identity and Entity Framework 7. Note: EntityFramework 7 currently only has provider for SQL Server, SQLite, and InMemory provider. Npgsql also has an EF7 experimental provider. I occur error “column Extent2.IdentityUser_Id does not exist” when i used AspNet Identity with entity framework. Please help me! Thanks………. Note: I took a quick look at the source. It’s using ado.net with npgsql not EF. I’m on a traineeship and i have to create a web site using ASP.NET MVC 4 with postgresql..I managed the connection to postgres using your demo(Thanks a lot). but I don’t seem to fin a way to use mvc membership with postgres, can you help me with that please ??! Thanks a lot for your fast response and I apreciate your suggestion. Fortunately I managed through PgProvider to get membership to work with postgres, but I’ll look further in your suggestion. Would you please guide me to a tutorial working with identity if there is one? Nice tutorial.Is their any tutorial with Asp.net Core Identity 3 using postgresql ???? ?